This is a 20-minute narrated seaplane flight departing from Lake Washington. You will see the downtown Seattle, the Space Needle, the Ballard Locks, Lake Washington, and much more! Take a float plane charter flight for unsurpassed aerial views of the Emerald City and panoramic Northwest vistas. The sensational experience of taking off and landing on the water combined with the amazing views of Seattle and Puget Sound come together to create the memory of a lifetime. Leave long drives and traffic behind to get a complete, succinct orientation of Seattle and the Puget Sound. There’s simply no better way to get familiar with the Northwest than by soaring over it. 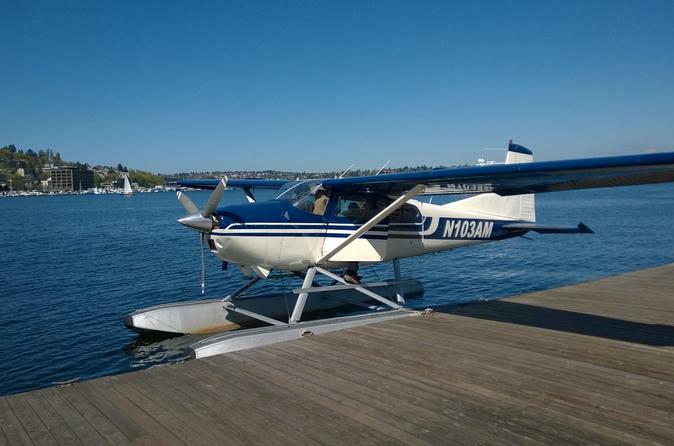 Meet at Wiley Post Seaplane Base in Renton or Carillon Point Marina in Kirkland and climb aboard your plane for a 20-minute narrated seaplane flight. Leave long drives and traffic behind to get a complete, succinct orientation of Seattle and the Puget Sound. You will be provided with comfortable, noise cancelling headsets to clearly hear the pilot’s personal narration during the flight. Your professional, knowledgeable and enthusiastic pilots will point out historical sites, interesting features and fun facts throughout your excursion. Among many of the captivating views you may get to see are the City of Kirkland, Lake Washington and it’s distinct floating bridges, the beautiful University of Washington Campus, Lake Union, the Ballard Locks, Puget Sound, sweeping views of Seattle’s skyline and downtown, sports stadiums, the iconic Space Needle, the Cascade and Olympic mountain ranges along with majestic Mt. Rainier. skyline. Providing flexibility to suit customer needs, these tours are available throughout the year.